Originally released in 1984 for the NEC PC-6001 and ported to the NES in June 1989 by T&E Soft, Hydlide is an action role-playing game focused on the knight named Jim, as he attempts to restore peace to the kingdom of Fairyland and overthrow the wicked rule of the demon Boralis. Best time with deaths: 0:15:45 by Jeff Feasel on 2012-08-08. 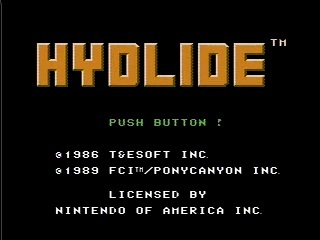 Hydlide is a quirky game that predates Zelda 1 but introduces some of the basic elements of the action-rpg/adventure game that would later define the genre, though it does so in a very rudimentary form. It is not a very friendly game for a first-time playthough since some of the puzzles are all but unsolvable without an FAQ and the game gives no hint what to do. But from a speedrunning perspective it is quite attractive. Difficult, fast-paced, challenging to route-plan, with a high skill-cap. Though there are many elements of randomness, there are strategies to mitigate the luck factor. As you get familiar with it you start to learn the places where a bad spawn can come out of nowhere and kill you, and you'll either avoid the spots or safety-save. (In this run you'll see a few saves that appear to be for no reason, and this is why.) Monster movements are the same way. They are random, but certain patterns tend to pop up, and you develop an intuition for what they're going to do. Ultimately Hydlide is not nearly the beast that it appears to be on the surface. This run was a collaborative effort between Dunnius and myself, and he deserves as much credit as me since there is no way to beat the game at such a low level without a really solid plan. Hydlide did not have an existing body of speedrun knowledge before the two of us began work on it. There is a TAS, which provided some insights but ultimately wasn't especially applicable to a real-time run given the way luck-manipulation changes the game. There is also a TAS of the japanese version which uses an easter-egg password to beat the game with invincibility. Also not that helpful. So basically we were starting from scratch, and we ended up trying many route variations and doing a lot of experimenting to deconstruct the game engine. Dunnius wrote a LUA script for enhanced display, which will probably be made available once the new TAS is done. There are no real glitches in this run, however I use save/load extensively to manipulate RNG and a tactic (that may not have been intended) to fight the final boss at a relatively low level. The most time consuming part of the game is grinding to a level high enough to fight the Dragon and Varalys. I am able to shortcut this by going straight to the Eels, which are the most lucrative enemy in the game. For the first 2 levels, they give 50XP each, which is half of what it takes for a levelup. Eventually they drop to 10XP and then 5XP each. Once I reach level 6, this causes a change in the overworld monsters so that you can spawn Hypers anywhere there is a slime, which then makes the lower-middle screen of Island 3 the fastest place in the game to earn XP. I do this to reach level 7, which we believe is the optimal level at which to fight Varalys. Fighting Eels in the water at low levels is just barely possible, despite the life-drain, through save-load manipulation and familiarity with their patterns. The Hypers are faster and less predictable than the Eels, but fortunately I only need to earn 1 level off them. I skip the lamp, so the underground areas are done in the dark. This also means that I can skip the cross and skip killing the vampire. Doing the sword cave first is nice because the monster behavior always begins the same way (and diverges as you waste frames here and there) so if you are extremely consistent with how you do the beginning of the game you can manipulate the movements of the Wisps. I was able to find a patttern that allows me to get in and out without getting hit most of the time. In earlier versions of the route I got Fairy 1 first, since you can force the location of the fairy by holding the Start button between the title screen and the "game start" screen (the location is controlled by how many frames elapse at the "game start" screen). However, Dunnius discovered that it's significantly faster to do the backtracking for the Jewel last and use Fairy 1 to warp to the final island. (You warp as soon as you grab the last fairy, regardless of what order you collect them). After the Sword I get the Pot and the Key. The Key is randomly located in one of 8 spots in the cave. The location is randomly chosen every time you load a game. Two of the 8 spots are accessible without going far off the shortest path. So what I do is save my game on top of one of the spots, load it, check both locations, load again, repeat. Checking 2 spots out of 8 each time means that it shouldn't take more than a couple iterations to get it. It took me longer than average to get it in this run, but still less time than it would take to search all 8 locations. Fairy 2 is randomly placed in one of 4 trees. The trees hurt you, and you only have 10 health at level 1, so it can be tricky to search for it without dying. I got pretty lucky in this run and found it on the first try. After that I head to the entrace of Island 3 and use those two screens to fight Eels. I grind to level 6 on the Eels and level 7 on the Hypers. I had several deaths in this part, which is pretty typical. I could fight the Eels on normal speed instead of high speed and have a lot fewer deaths, however doubling the speed actually outweighs the costs of those deaths and I decided that it's better to have the run look a little less clean if it means saving substantial time. A deathless Eel-grind is possible, but it would take some luck. When you're looping around to get behind the Eel there's always a chance it can turn 90-degrees without warning and kill you. Unfortunately this can't be prevented. After the Eels and Hypers, I get Fairy 3 from the wizards. This is a big pain -- you have to hit both wizards with the same Wave shot, and they must be lined up horizontally because Wave only goes left or right, not up and down. This means you have to hope the wizards are very cooperative. I find the best method is to wait near the upper left corner for the wizards to line up, then move off the screen to the left and move down to the appropriate row before coming back onto the wizard screen with A and B pressed. Keeping track of the correct row during the screen transition is actually pretty tricky. Pro-tip: put your finger on the TV screen so you don't lose the spot. After that I backtrack to pick up the remaining items. I get the Shield and the Ring. The Shield is not a required item, but it makes the Dragon go faster and it makes Varalys fightable at a lower level, so it's definitely worth the time to get. After the grinding, this cave is probably the 2nd most difficult part of the run (possibly tied with the Varalys fight). First you have to kill 3 Ladyams without killing any Goldams, then you've got to kill 3 Goldams without killing any Ladyams. Both of these things need to be done without any deaths or save-loads. The one saving grace is that enemies killed with magic do not count. So if you're in a position where you are forced to kill the wrong enemy type, you can do it with Fire magic. Finally I head back to the first island for the Jewel (which you can't get without backtracking since it requires the Key) and Fairy 1. After warping to the final island, I do the Tomb, kill the Dragon, and get the Ruby (which in the japanese version is called the "Luby"). The Dragon is fairly straight forward. You have to fight him in Defend mode, he trades damage with you on every turn, and it's really just an endurance game. You hit him, run away, recharge, and repeat. The only thing that can go wrong is the Hyper spawning on the castle island. Varalys however is a serious challenge. You also fight him in Defend mode, and he hits you every time you hit him, except that he deals damage at about 4 times the rate that you do. So even at maximum level, you'd need to fully recharge your life several times before defeating him. During that time you can not save-load or die. However I discovered a trick that can be used to greatly shorten the fight. When you touch Varalys in Attack mode you'll be killed instantly. However, you'll simultaneously deal a huge hit of damage that reduces Varalys's health by about 40 percent. You have the Medicine item, which gives you a one-time refill of your life. So the strategy is to fight Varalys in Defend mode until you are one hit away from death, press the A button to switch to Attack mode, get instantly killed (while simultaneously dealing a large chunk of damage), refill life with the medicine, fight him again in Defend mode until you're almost dead, leave the room and recharge your health, and then finish him off in Defend mode. At level 9 you can do this without the "leave the room and recharge" part. You have just enough health that you can deal the suicide-blow and then immediately finish Varalyis in Defend mode after using the medicine. At level 8 you can do this with just a little bit of recharging (only about 10 points of health), so you simply need to step out of Varalys's room to the west and wait in the safe spot at the edge of the screen for about 10 seconds. At level 7 (what I use in this video) you need to fully recharge your health in order to make the final pass at Varalys, and the most efficient way to do it is to leave the castle entirely so you'll recharge at a faster rate outside in the grass. It means traversing the Blackam maze two extra times without the ability to save-load, which is kinda rough. But eventually you get used to the Blackam patterns, you can sometimes ambush them safely at corners, and you can cast the Fire spell if you get trapped. At level 7 you need to spend more time recharging your health than you would at level 8 or level 9, however the amount of time that it takes to grind the extra level or two is substantial, and it ends up being worth having a longer/tougher Varalys fight to avoid the extra levelling. It's possible to kill Varalys at level 6, but you'd need to make two recharge trips instead of one, and the cost of the extra recharge (and slower Dragon fight) is probably worse than the cost of killing 50 Hypers to earn level 7. I wish the Varalys fight in this particular run had gone better. I had one failed attempt which ended up losing me about 20 seconds and looking just plain bad. Still, the fact that I got it so cleanly on the second attempt puts this run ahead of most of my other runs. So there it is. Hydlide. Appreciate its charm. Don't judge it. Say hello to it if you see it walking down the street. Hydlide wants to be your friend if you'll let it. Enjoy the run, and consider it a small victory for misunderstood games everywhere.